This is my current project. I am about 19 percent finished with the first draft of my Black Hack based game. So far, character creation is finished. The goal of The Red Concordant is to provide a few more options and examples for newer players. The final product should be about 10,000 words. The text of the game will always be 100% OGL. I will publish a PDF, RTF, ODF, and DOCX version of the text. I have been writing updates on Google+ in my RPG Ideas and Projects collection. Starting with this post, updates will also be posted on my Facebook page. I’ve quoted the beginning of the book below to explain the game. What is The Red Concordant? The Red Concordant is a game that provides classic fantasy adventures. The rules are broadly based on role-playing games of the 70s and early 80s. Specifically, the rules are based on The Black Hack to give it a simpler, streamlined flavor. The goal of this game is to have fun in a series of adventures, not to get bogged down in the minutiae of the rules. 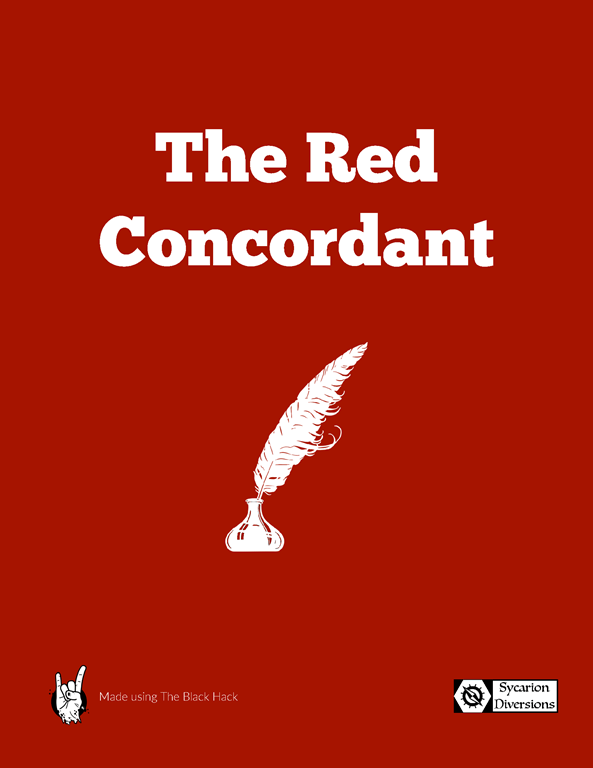 The Red Concordant is also a framework for you to have adventures in your own worlds. A standard world is sketched out, but tools for making this game yours are provided near the end of the book. In short, there is no wrong way to play this game if everyone is having fun. Hopefully, I’ll have the first draft finished by June. Stay tuned! ← Wrote another 800 words so far today. This finished up the backgrounds, including a non-standard fantasy race. This update also defined four classes.